With temperatures plunging and snow in the forecast, drivers in Western Washington need to prepare for slippery road conditions. Although Monday’s brief flurry of flakes was mild and did not stick in Seattle, meteorologists are predicting heavier snowfall from late Thursday afternoon into Friday morning. Meteorologist Cliff Mass pointed out that making exact predictions has been hampered by failures of major systems at the National Weather Service. He estimates that colder and drier air, combined with a greater amount of precipitation, will bring snow to the Seattle area some time between 4 p.m. and 6 p.m. on Thursday. That could snarl traffic during Thursday’s evening commute. Could this be the next Snowmaggedon? In the winter of 2010, Seattle was slammed by a snow storm that left many roads in our hilly city impassible. Cars, trucks, and even buses were seen slipping down inclines; although the precipitation was not too severe, the roads in many areas were almost completely iced over. Some revelers took to the streets on homemade sleds while their schools and offices were shut down. Since then, not much has changed about the city’s response to snow and ice. Seattle has famously struggled to control slippery roads; due to concerns with snowmelt running off into our city’s lakes and waterways, the Seattle Metro area typically does not use rock salt on roads, even steep and icy thoroughfares. While the Washington State Department of Transportation uses a mixture of saltwater, calcium chloride, and de-sugared molasses to clear passes during the winter, Seattle cannot use this solution due to its high salt content. That means that if Seattle’s roads ice over, crews will most likely attempt to fix the problem not with salt, but with sand and chemical de-icer. 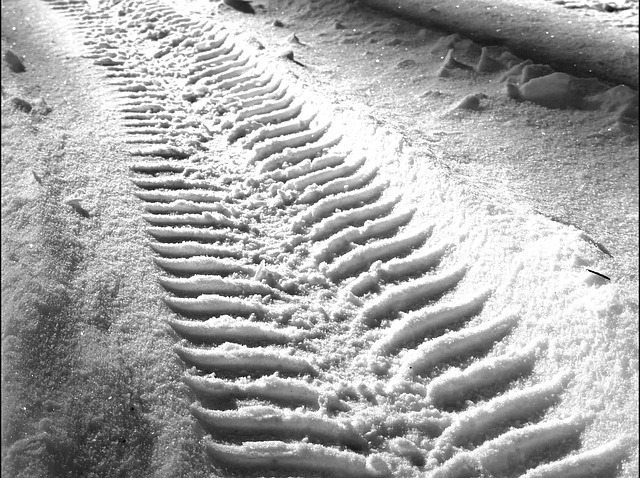 The goal of this strategy isn’t to melt the ice, but to create a hard-packed surface that will be less slippery for cars with all-wheel drive, four-wheel drive, or chains. If you can’t make it to your school or office safely, stay home. Watch the weather forecast, and plan around snowfall. Check the Washington State Department of Transportation’s Winter Weather Map for details about closed streets and the routes of de-icer trucks and snowplows. If you must drive, travel slowly. If your car has a front-wheel drive, make sure that you have appropriate tire chains. If you need to take public transit, check your route and make sure that your bus, train, or ferry isn’t canceled or operating on a different schedule.